Howard would not let me drive to church this morning because of the high winds. He was afraid a tree was going to fall on me or something. So I had to go out to Cheektowaga at 1:30 p.m. and hit the Latin Mass at Our Lady Help of Christians. I do not like my routine being broken and immediately I found myself growing agitated. An altar boy came out and lit two candles. I'm thinking, what, is this a Low Mass, not a High Mass? A high Mass is six candles. I am thinking, at St. Anthony's we would never settle for a Low Mass on Sunday. So now I'm in a bad mood and then a woman comes in with a little kid and sits behind me. And I'm thinking: Great. All the pews in this church and someone with a kid sits behind me. Kid, you better not kick my pew. That is what I am thinking. Great attitude, isn't it, in which to go to church? I am so brittle and easily annoyed. I have to fix that. Except Leonard Pennario was that way too and it was one reason we were friends. So that was one benefit of being the way I am. Today the good news was that the Mass was not a Low Mass, it was a cross between a Low Mass and a High Mass and they wound up lighting four candles. You figure that out. I cannot. There was singing, to my relief. Again, though, trouble: Everything was way too fast. Ubi ignis est? That is a phrase I remember from Latin class in high school. It means, "Where's the fire"? And then ... and then ... I had to attract attention to myself. I just had to. The priest, he had a bad knee and the altar boys had to help him up and down steps and things. And at sermon time he makes his way to the podium and he explains that because he has put off his knee surgery too long, and he is going to have to give in and get it, but for today, he can't stand so there will be no sermon. Then he says, "You're smiling. That's good." He was looking at me! Because I am sitting there with this big grin. I guess I was relaxed by that time and I was smiling encouragingly at him as he talked about his knee. Then I'm mortified because I'm thinking, he thinks I am glad there is no sermon because I want this Mass over with. Not true! I wanted it to slow down as I have already said. Just once I would like to not make a jerk out of myself, you know? Just once. After Mass I went shopping at Airport Plaza. It was practically across the street. I do not normally consider going shopping after Mass because you have to have all this unholy music being blasted at you but today I could not help it. It is not every day I get to Airport Plaza. The wind was whipping and it was hard to get in and out of the car but that did not stop me from going to Goodwill where I bought a purple velour shirt just because the label was "Von Mozart." I have never heard of that label and this was a shirt I had to have. I also bought an LP called "Chants and Polyphony of Medieval Germany." I am going to have a party where I play that record. Y'all have to come. Then I went to this dollar store where they were having a closeout sale, everything 50 to 75 percent off. There are no words to describe what I found in there so I will leave that for now. The high point of my day was feasting my eyes on the Airport Jewelers kiosk. That is a picture of Airport Jeweler up above for the benefit of out-of-towners. There is no place like it in the world. 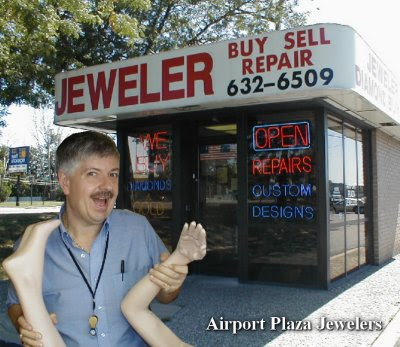 Howard always says Airport Jeweler is so beautiful. No overhead, just pure profit. And those commercials! Airport Jeweler gal: "Why so sad, old gold?" Old gold jewelry: "Nobody wants us!" Airport Jeweler gal: "We do! We buy old gold! All of you come along with us!" Old pocket watch (in doleful voice): "Can I go, too?" Airport Jeweler gal: "Sure, old timer! We take everything!" Ha, ha! I just asked Howard, "Howard, how come we didn't buy our wedding rings at Airport Jeweler?" He said: "They weren't cheap enough." A party to hear Chants and Polyphony of Medieval Germany? "Y'all have to come."? Sure you really mean "all"? Don't worry, just jerkin' your chain.